New 500 & 2000 Rupee Bank Notes - How to identify new Bank Notes? The public can exchange the old high denomination notes in the next 50 days (10th Nov to 30th Dec, 2016) in any Bank or Post office branch. 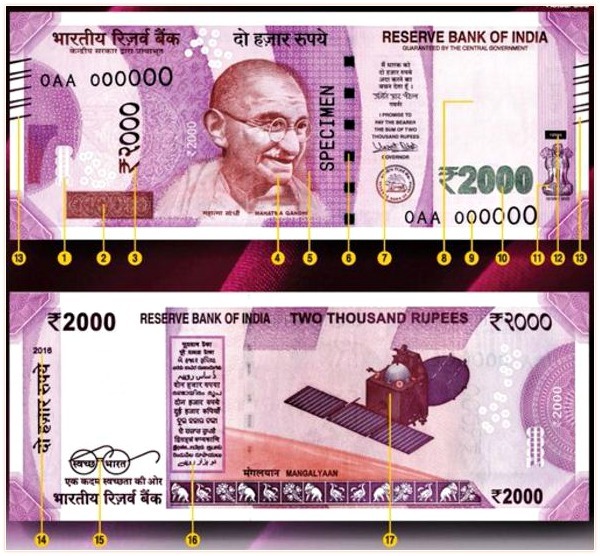 The RBI will shortly issue Rs 2000 denomination banknotes in the Mahatma Gandhi (New) Series, bearing signature of Dr. Urjit R. Patel, Governor, Reserve Bank of India, and the year of printing ‘2016’ printed on the reverse of the banknote. The dimension Dimension of the banknote will be ’66 mm × 166 mm’. The new denomination has Motif of Mangalayan on the reverse, depicting the country’s first venture into the interplanetary space. The base colour of the note is magenta. The note has other designs, geometric patterns aligning with the overall colour scheme, both at the obverse and reverse. 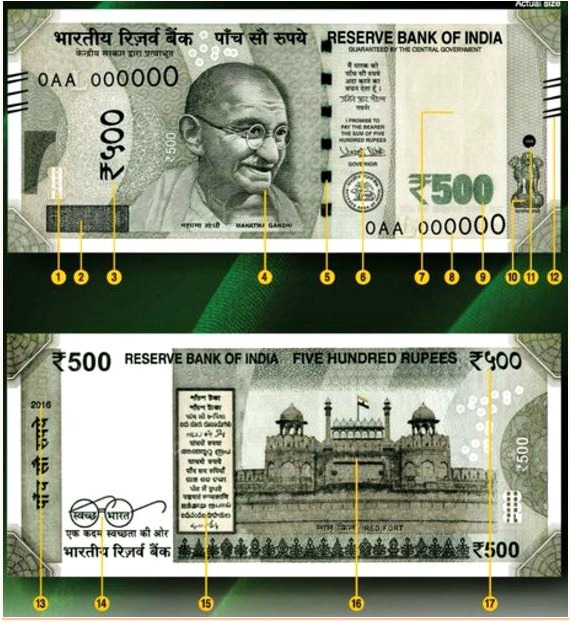 The Reserve Bank of India will issue 500 denomination banknotes in Mahatma Gandhi (New) Series with inset letter ‘E’ in both the number panels, bearing the signature of Dr. Urjit R. Patel Governor, Reserve Bank of India, the year of printing ‘2016’ and Swachh Bharat Logo printed on the reverse of the Banknote. The banknote also has features (intaglio printing of Mahatma Gandhi portrait, Ashoka Pillar emblem, bleed lines, circle with ` 500 in the right, and the identification mark) which enable the visually impaired person to identify the denomination.